Some mouth warts can be cancerous. The first picture below was the first time noticing a wart. the second picture on the right was more that popped up about a week later. Papillomatosis is used to describe a tumor on the surface of the skin. A virus, known as the papillomavirus, causes the growth. This makes the appearance wart-like. These are called benign skin tumors caused by the canine oral papillomavirus. The pigmented appearance normally presents as a rough surface that is flat in appearance and black in colour. They have the appearance of a cauliflower and can be black or white in color. 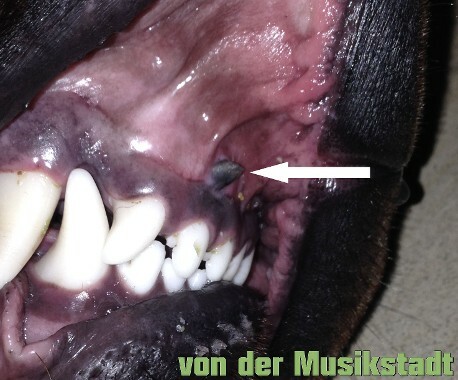 They generally occur in the mouth gums, lips and muzzle of young dogs under 2 years of age. Papillomas can grow on the eyelids, inside the ears, surface of the skin, and between the toes. Most commonly they will start to grow in groups throughout the mouth. Papillomas normally go away on thier own but it depends on the dogs immune system to fight the virus. It can take 1 to 5 months for the virus to go away with or without antibiotics. 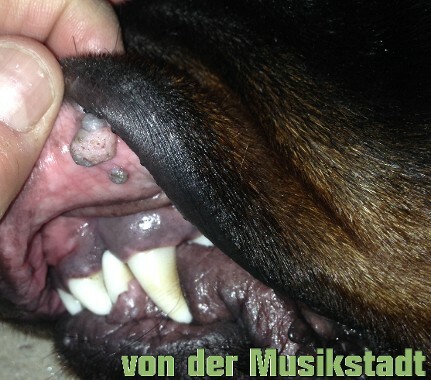 It is possile for the wart like tumor to spontaneously disappear because the dog slowly developes a immunity to them. In most cases you should have the tumors removed because it can spread among dogs and cats. When spreading starts it can become more difficult to eat because the papillomas can go down the throat. The papillomas must be frozen off cryogenically or surgically removed. Papillomas can be different in color, shape and size. They can be flat scaly on the surface, can be crator like in the skin, and most common protrude out with the cauliflower appearance. I have personally seen dogs get papilloma virus by drinking nasty stagnant water. You need to watch what your dog drinks when out in the yard. The most common place around the home would be your air conditioning unit where the water run out onto the ground and then a green fungus starts. That is nasty! not only will your dog contract papilloma but your dog will get sever bacterial infection in the intestines called Giardia. I personally know someone that had a sewer problem and the dogs were drinking from the backed up sewer water. The dogs got the virus and my friend had to have the warts removed.